Trinity International is always interested in working with Estates and collections alike in evaluating and arranging sales either through auction or private placement of quality works of art. Unlike many auctions houses, we pride ourselves on being able to provide a quick answer on inquiries by an owner who is empowered to make a decision. Please consider Trinity International Auctions as an excellent source for the placement of your fine art works. 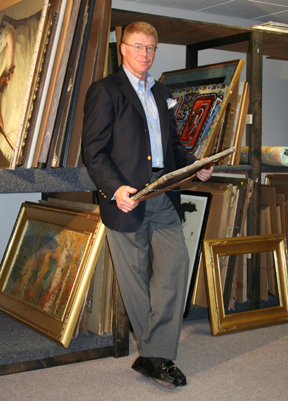 Trinity International Auctions and Appraisals, LLC, (TIA) established in 2006, is a leading auction house of American, European and international fine art. Located in Connecticut's picturesque Farmington Valley, midway between Boston and New York City, TIA offers its local, national, and international clients an extensive and wide-ranging collection of art at our five onsite and online auctions it conducts yearly. TIA also provides a broad spectrum of appraisal services, including liquidation and insurance evaluations. Stephen R. Gass, President and founder of TIA, brings a unique and unparalleled blend of business acumen, scholarship and professionalism to buyer and consignor alike. Gass is a respected leader of the Greater Hartford, CT arts community. He has served as President of the Farmington Valley Arts Center, on the Collectors Council of the Wadsworth Atheneum, and on the Acquisition and Loan Committee of the New Britain Museum of American Art. In 1973, Gass received a masters degree in Economics from Trinity College in Hartford, CT. In 2008, he achieved a second masters degree from Trinity College in American Studies with a concentration in Museum Studies. Prior to his starting TIA, he was an Executive Vice President at The Watson Group in Wethersfield, CT for over 20 years. Trinity International is always interested in working with estates and collectors alike in evaluating and arranging the sale either through auction or private placement of quality works . Unlike many auctions we pride ourselves on being able to provide a quick answer on inquiries by an owner who is empowered to make a decision. Please consider Trinity International Auctions as an excellent source for the placement of your fine art works.